CAT5e and CAT6, did you ever imagine that milk their cabling for more bandwidth? Yes, you may, because Cisco never stops the innovating. It keeps going in developing its technologies in series of routing, switching, wireless, cabling and security products. Last month, Cisco and several partners announced an alliance aimed at developing 2.5 and 5 Gigabit Ethernet (GbE) technology to enable faster data rates on existing Category 5e and Category 6 (Cat5e and Cat6) cabling. It means that Cisco tries to milk Cat5e and Cat6 cabling for more bandwidth. Emerging Wi-Fi standards–including 802.11ac Wave 2–will introduce wireless speeds that will exceed the 1 GbE network access layer that most enterprises have. To take full advantage of 802.11ac throughput, enterprises would need to upgrade to 10 GbE at the access layer, which would require most of them to upgrade cabling–an expensive and time-consuming undertaking. To meet Wi-Fi backhaul demands, Cisco’s new consortium–the NBASE-T Alliance–will develop 2.5 and 5 GbE switches that can deliver faster data rates on existing 1 GbE cabling. It will specify 2.5 and 5 GbE switches that can run on existing Cat5e and Cat6 copper cabling. We also shared some main difference between Cat5e and Cat6, and now we will have more comparison of CAT5, CAT5e and CAT6. CAT5, CAT5e and CAT6, all of these are twisted-pair copper cable that is used to carry signals. They are most often used in computer networks, but can also be used to move data in home theatre applications. Every cable on the market has product standards set by the Telecommunication Industry Association and the Electronic Industries Association. These three cables have very similar guidelines and differ mostly in their performance level. CAT5–Category 5 cable is the current standard in high-speed internet, it is capable of transmitting information 10x faster than CAT 3. CAT 5 cable is available in two varieties: unshielded twisted pair (UTP), which is more sensitive to EMI and screened twisted pair (SCTP), which provides more protection against EMI. 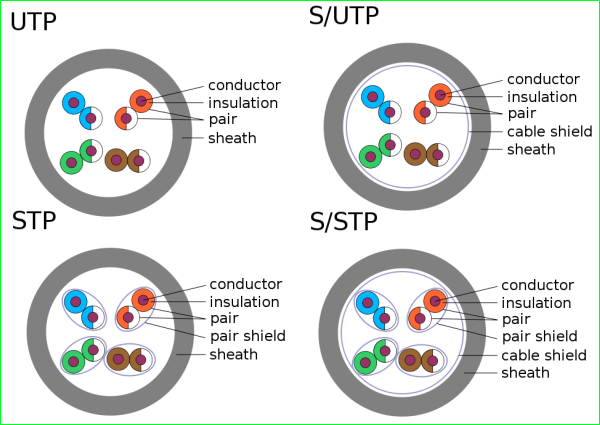 The UTP version is widely used in the US, while the SCTP is rarely used outside of Europe. CAT5 can carry data up to 100 Mbit/s (12.5 MB/s) with possible bandwidth of 100MHz (100 million cycles per second). Cat 5 is rated at 100-BaseT. CAT 5 cables are solid or stranded. Solid Cat 5 Cable is rigid: used for long distances, whereas stranded CAT5 Cables are flexible: used for patching. CAT5e (Category 5, enhanced) – Category 5, enhanced has the same specifications of basic CAT 5 cable however, it can handle data transfers up to 1000Mbps (1Gb/s). It is suitable for Gigabit Ethernet, and is less susceptible to near-end cross talk (Next) , the interference between two pairs in a cable measured at the same end of the cable as the interfering transmitter. Next is usually caused by crossed or crushed wire pairs. 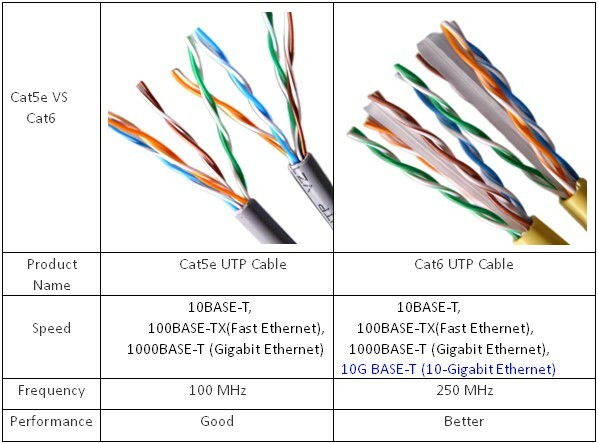 CAT6 – Category 6 cable – is a more advanced version of the listed cables, it’s performance exceeds its predecessors. CAT6 is made up of four twisted pairs of copper by a longitudinal separator, a structure that isolates each of the four pairs from each other. The separator reduces crosstalk, allows for faster data transfer, and twice the bandwidth of Cat5. CAT6 supports Gigabit Ethernet, and can operate up to 250Mhz (250 million cycles per second). CAT6 is backwards compatible, can support exisiting CAT5 and CAT5e cabling. CAT 5 is rated for 1000BASE-T.
How to Connect to a Cisco Standard Console Port (RJ-45)?